GREEN COVE SPRINGS, Fla. - Twice a week inside Thomas Hogans Memorial Gym laughter and cheering can be heard against the rhythmic pop of racquetball-style paddles lobbing what looks like large ping-pong balls over a tennis net. 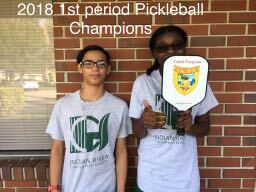 It’s the sound of Green Cove Springs swinging into the growing sport of pickleball. 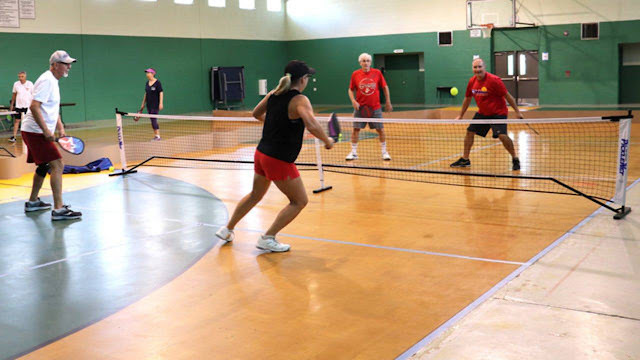 Pickleball is a combination of tennis, badminton and ping-pong. It’s played on a tennis court with smaller boundaries, and players use a large paddle to hit a large, yellow plastic ball with holes over the tennis net to gain points. 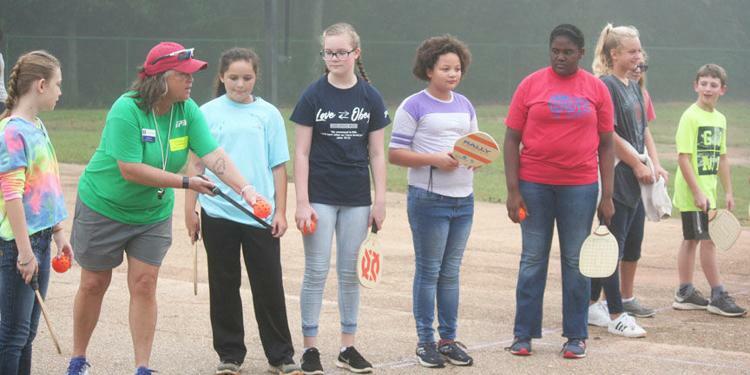 The program is led by Green Cove Springs Parks and Recreation Program Director Glee Glisson, a competitive pickleball player. With Tim Murphy, music minister of First Baptist Church in Middleburg, Glisson has competed and won several pickleball tournaments in both age and skill level brackets. The 68th year of the "Hiawassee Parade" kicked off on July 21, 2018 with the theme of "Hometown Pride." Over 70 players from the Georgia Mountain Pickleball Club participated and the awesome float can be viewed on YouTube here. On the float, you will see the "pickle" and "ball" characters waving at the crowd and promoting the sport as we move along the route towards the fairgrounds.We had many that volunteered for this float project and worked numerous hours to get it completed on time. Beth McCoy had a vision and worked tirelessly on the entire project for weeks, including making her own "Ball" costume! She was the driving force behind the project. Many others volunteered numerous hours----Dean McCoy, Blake Harper, Virginia Steiner (dance coordinator), Tammy Lentini, Mark Petty and Eddie Palmer as the "pickle." 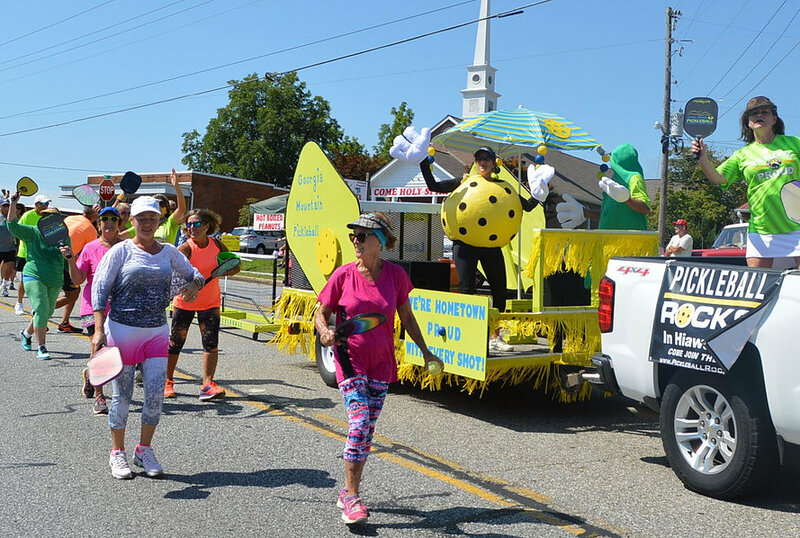 As always, our Ambassador, John Hall who devotes an enormous amount of time for all things pickleball in Towns County participated in every aspect, including walking the 2 miles with the float to the parade end. The small demo net that was pulled behind the float for demonstrating the sport was a classic, thanks to Blake Harper. We also had 70 players that donated their time to walk with the float and interact with the parade goers the entire 2 miles on a hot July day. Unfortunately, we didn't place in the contest for best float, but no one had more energy or volunteers then the pickleball float! Since the parade, we have had new players flocking to the courts on Saturday mornings for the novice classes. That is what you call "pickleball success!" Cape Coral resident Mike Welter participated in the Michigan Senior Olympics in pickleball this past weekend. He won gold in singles and gold in mixed doubles with Nancy Robertson of Naples and took bonze with Glenn Geda of Michigan. 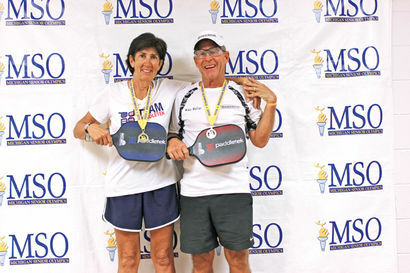 Last month Welter participated in the Ohio State Senior Games and took gold in singles and gold in mixed doubles with North Fort Myers resident Bobbi Little, and took silver with Denny Vincent of Columbus, Ohio, and a part-time resident of Naples. 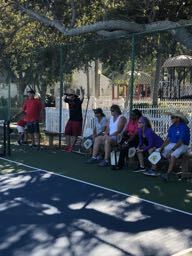 These games were both qualifiers for the National Senior Games in June, 2019, in Albuquerque, New Mexico. A little over a month ago, a friend and I were working out at a local YMCA and could not help but notice how much fun a big group of people were having playing what looked like a smaller version of tennis in the gym. So we went in, were handed a set of paddles and given a crash course on pickleball. In fact, it has become a new facet of my fitness journey — one that has seen me drop 115 pounds in the last year and a half. That weight loss helped my agility on the small courts — enough to chase that little whiffle ball down for corner shots. Fast forward a few weeks to an email inviting me to come out for a morning of pickleball at Sun-N-Fun RV Resort in Sarasota, a chance to experience the outdoor game for the first time.